PICS & VIDEOS: CHIEFS FANS PUNISHED! PITCH invader Kwezilomo Madiba (35) seemed shocked when he was sentenced to three years in jail for assaulting a security guard. His eight co-accused pleaded guilty in November to the charge of pitch invasion. John Memela (32), Siphosethu Khumalo (29), Cebolendoda Hadebe (21), Douglas Mkhize (42), Nolwethu Cokotha (33), Zibongile Njova (33), Sihle Zungu (27) and Dennis Thusi (35) were given three-year suspended sentences and 12 months’ house arrest. They must do community work and go for anger management. 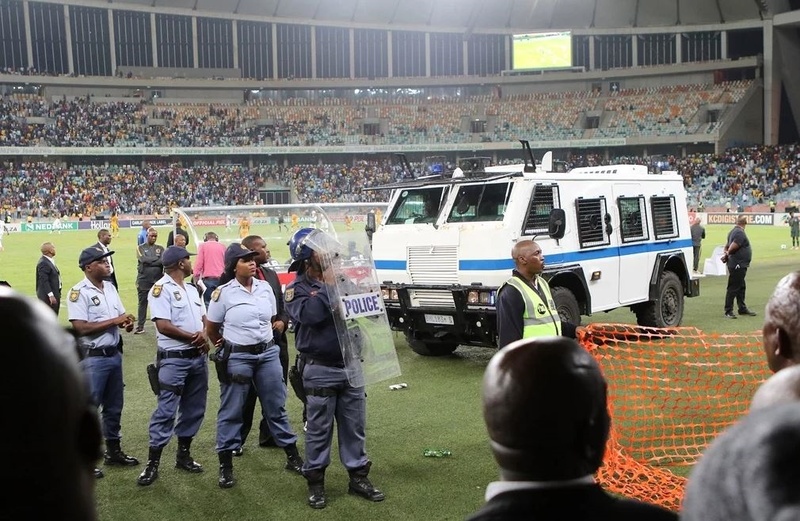 Magistrate Sifiso Luthuli said in the Durban Magistrates Court yesterday that the pitch invasion was a serious offence that resulted in millions in damage. He said the accused were disappointed Kaizer Chiefs fans. “Why damage the stadium if you are disappointed?” he said. Madiba has a previous assault conviction. Luthuli said Memela, Khumalo and Madiba wrote an apology to President Cyril Ramaphosa, eThekwini mayor, the PSL and Safa.